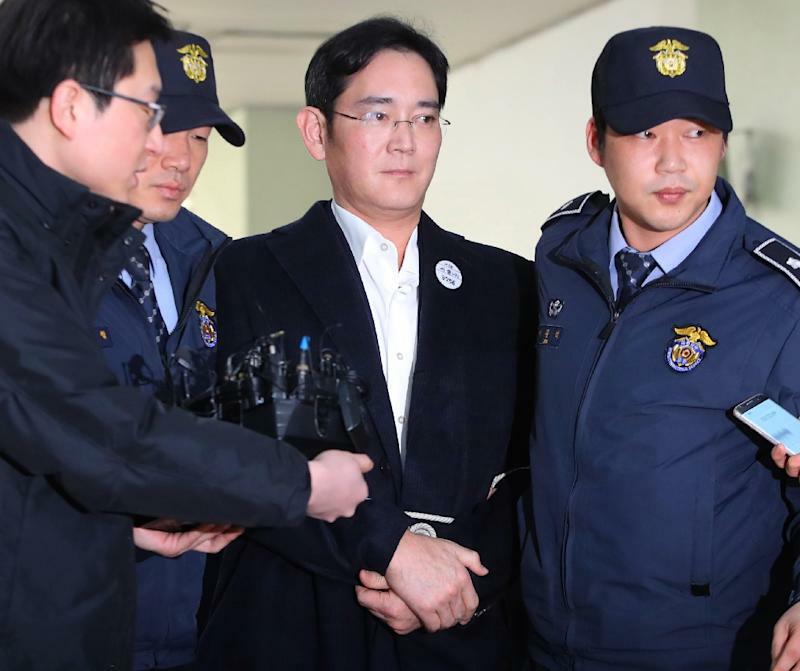 Lee Jae-Yong,the Samsung heir appeared in public handcuffed and bound with ropes, .He appeared for questioning Saturday over his alleged involvement in the corruption scandal currently engulfing South Korean President Park Geun-Hye. Among other allegations, Lee is accused of paying nearly $40 million in bribes to a confidante of the impeached president to secure policy favours. The conglomerate's de facto head stared straight ahead as he was greeted by a horde of journalists and camera flashes upon his arrival at the office of special prosecutors investigating the case. glimpsed under the sleeves of his well-tailored, navy suit and white ropes around his arms and back. A badge on his chest bore his prisoner number. During his first night at the Seoul Detention Centre, Lee was detained in a one-man cell instead of a six-person room -- a privilege reserved for dignitaries, local news reports said. But the 6.27 square-metre dwelling was a far cry from his four-million-dollar home in Seoul. Like all others awaiting trial, he spent his time in detention wearing an inmates' uniform and eating prison meals -- rice, soup and three side dishes -- worth 1,440 won ($1.26), served on a plastic tray and slid through a small window in the cell door. Food brought from outside is prohibited, the Chosun Ilbo daily said. After meals inmates have to clean trays themselves and sleep on folding mattresses. A single-channel TV, whose programme is pre-selected and recorded by authorities, is allowed only during the day. Other inmates at the detention house include Choi Soon-Sil, a close confidante of the president who is at the centre of the influence-peddling scandal, the former head of Park's presidential staff and her ex-culture minister. All are incarcerated in their own single cells. But prosecutors on Tuesday made a second bid saying they had collected more evidence in recent weeks, and Lee was later arrested. The scandal centres on Choi, who is accused of using her close ties with Park to force local firms to "donate" nearly $70 million to non-profit foundations which Choi allegedly used for personal gain. Since his father suffered a heart attack in 2014, Lee has effectively taken the helm of Samsung. Lee Jae-Yong's arrest was seen as a blow to Park who is staging an uphill battle at the Constitutional Court to overturn her impeachment by parliament.